I recently finished reading “Russia’s War: A History of the Soviet Effort: 1941-1945“. I’ve read many books on World War II, from many perspectives, but I’d never read one on the part of the war that involved Germany and the Soviet Union. I realize now that part of the reason for that is the lack of information about the Soviet effort prior to the fall of that nation in 1991. With the archives more accessible, a book like this one could be written. 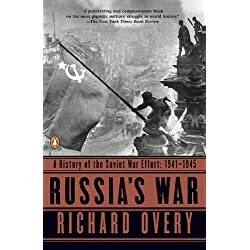 I knew from earlier reading that the Soviets contributed massive numbers of men to the war, but reading this book made me appreciate what they did far more than before. As a good American son of a World War II veteran, I grew up firmly ensconsced in the belief that the United States saved the Old World by overwhelming the Germans, Italians, and Japanese when they had the Allies pinned back against the wall. Accounts like the one in this book, however, make you question some things. At the time of the Normandy invasion, the Soviets were facing four to five times as many German troops as the US, British, and other Allied armies. The strength of the German army was being, and had been for a year, sapped in the East. I’m not belittling the efforts of the United States and Britain, but an honest assessment has to give the Russians their due. The United States truly was the Arsenal of Democracy, but the Russians supplied the bulk of the manpower and suffered the most casualties by far. Their industries turned out amazing numbers of tanks, guns, and other military hardware, by devoting nearly all their industrial capacity to the tools of war. But they were able to do this because the United States provided much of the remaining goods needed by a nation. In all ways, it was a combined effort. But I knew much of that already, for the basic facts of manpower and casualty numbers were known. There was something else that caught my attention. During the 1960s and 1970s, when the Cold War was churning, it was always acknowledged that in the event of the Cold War turning hot, the Soviets would have a huge edge in manpower and tanks. The “party line” I always heard, however, was that the US and NATO would be able to balance that with the greater innovation and resourcefulness that would be inherent in “our” side, because of the differences between our respective societies, free world versus regimented, totalitarian world. But what struck me in this book was how, in the early days of the German attack on the Soviet Union, how junior and mid-level officers were able to change strategy and tactics to adapt to changing battlefield conditions, often in the absence of communications with higher command. It made me think that, in yet another way, it was a very good thing that the balloon never went up. After reading your post all I can say is ‘Agreed’.